Giant sound in a small package! Jackson JS Series guitars take an epic leap forward, making it easier than ever to get classic Jackson tone, looks and speedy playability without breaking the piggy bank. The new JS Series Dinky Minion JS1X is ideal for lil' shredders or grownup road dogs who need an easy-traveling instrument jam-packed with the features they love. The 2/3-scale JS Series Dinky Minion JS1X has a poplar body, speedy bolt-on maple neck with graphite reinforcement rods and 12"-radius rosewood fingerboard which hosts 24 jumbo frets and Jackson's classic sharkfin inlays. 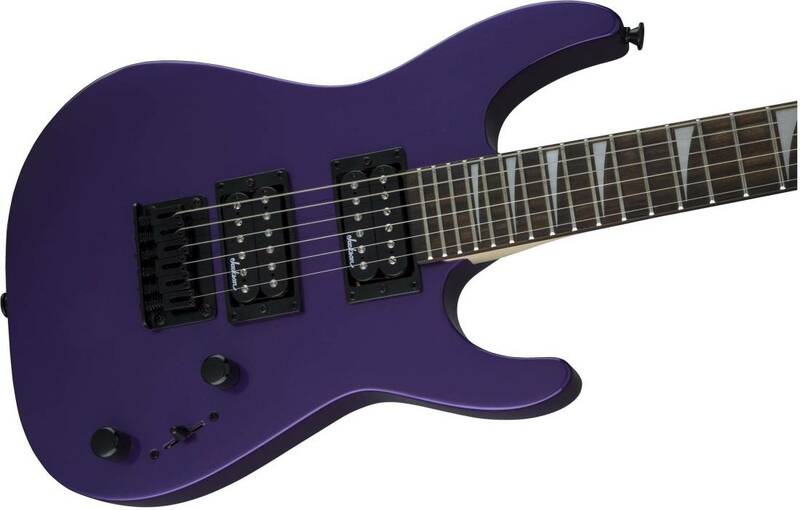 Other features include 22.5" scale length, rear-angled headstock for evenly distributed tension (reducing playing fatigue), die-cast tuners, sculpted heel for easy upper register playing, dual high-output Jackson humbucking pickups, three-way blade switching, jet black hardware and strings-thru-body hard-tail bridge for massive tone.